Find hotel near Antic Hospital De La Sant ..
Antic Hospital de La Santa Crue is also commonly known as Old Hospital de la Santa Crue. 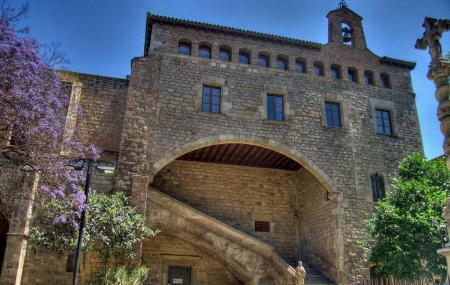 It is a building that was built in the 15th century in Barcelona. You can witness a lot of the architectural style of that time in the building of this architecture. It also has a very interesting history associated to it. Earlier in the past centuries, this place used to function as a hospice as well as a hospital. Hence, the name Antic Hospital De La Santa Crue. You will also witness a small but eye-catching gothic church adjacent to the hospital. It is a very interesting site and was made by one of the most celebrated architects of the time- Guillemd'Abriell. Love this? Explore the entire list of places to visit in Barcelona before you plan your trip. Fancy a good night's sleep after a tiring day? Check out where to stay in Barcelona and book an accommodation of your choice. How popular is Antic Hospital De La Santa Creu? People normally club together Sagrada Familia and Palau De La Musica Catalana while planning their visit to Antic Hospital De La Santa Creu. A great treat, if you are lucky to get in for free. Usually the ticket is 14 euro. We got in on Sunday for free + they had an open air salsa class inside the hospital complex. Everyone was cheering and the colors of spring were making you smile for no reason. The insides of the wards are not the most attractive thing, but the overall architecture and the colorful ceramic shingles make you forget you are in a hospital. My wife and I were so very pleased with this hospital. Our 7 year old daughter broke her arm on vacation. This hospital was compassionate, clean, professional, helped work through that we spoke a different language, and when all was finished, we had a very small bill to pay. Could not be more pleased with our experience here. Only wish the hospitals in the States were like this! It's so beautiful it takes your breath away! And it was a hospital! I'm not aware of such a gorgeous hospital anywhere in the world. Definitely worth a visit! Beautiful building. I only got the chance to see the outside and would love to come back again sometime to see the inside of the square if allowed because it looks so great and grande .